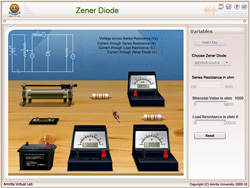 To construct a zener diode voltage regulator and measure its line and load regulation. Zener diode, resistor, variable DC power supply, milliammeter, voltmeter, Rheostat and wire. The Zener diode is like a general-purpose signal diode. When biased in the forward direction it behaves just like a normal signal diode, but when a reverse voltage is applied to it, the voltage remains constant for a wide range of currents. 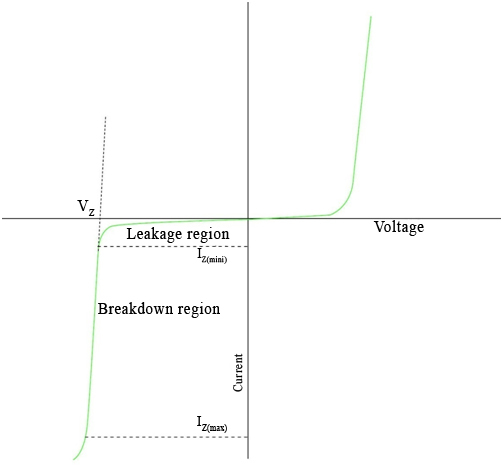 Avalanche Breakdown: There is a limit for the reverse voltage. Reverse voltage can increase until the diode breakdown voltage reaches. This point is called Avalanche Breakdown region. At this stage maximum current will flow through the zener diode. This breakdown point is referred as “Zener voltage”. The Zener Diode is used in its "reverse bias". From the I-V Characteristics curve we can study that the zener diode has a region in its reverse bias characteristics of almost a constant negative voltage regardless of the value of the current flowing through the diode and remains nearly constant even with large changes in current as long as the zener diodes current remains between the breakdown current IZ(min) and the maximum current rating IZ(max). Figure 2 shows the current versus voltage curve for a Zener diode. Observe the nearly constant voltage in the breakdown region. The forward bias region of a Zener diode is identical to that of a regular diode. The typical forward voltage at room temperature with a current of around 1 mA is around 0.6 volts. In the reverse bias condition the Zener diode is an open circuit and only a small leakage current is flowing as shown on the exaggerated plot. As the breakdown voltage is approached the current will begin to avalanche. The initial transition from leakage to breakdown is soft but then the current rapidly increases as shown on the plot. The voltage across the Zener diode in the breakdown region is very nearly constant with only a small increase in voltage with increasing current. At some high current level the power dissipation of the diode becomes excessive and the part is destroyed. There is a minimum Zener current, Iz(min), that places the operating point in the desired breakdown. There is a maximum Zener current, Iz(max), at which the power dissipation drives the junction temperature to the maximum allowed. Beyond that current the diode can be damaged. Zener diodes are available from about 2.4 to 200 volts typically using the same sequence of values as used for the 5% resistor series –2.4, 2.7, 3.0 3.3, 3.6, 3.9, 4.3, 4.7, 5.1, 5.6, 6.2, 6.8, 7.5, 8.2, 9.1, 10, 11, 12, 13, 15, 16, 18, 20, 22, 24, etc. All Zener diodes have a power rating, Pz. From Watt’s law the maximum current is IZ(MAX)=PZ / VZ. Zener diodes are typically available with power ratings of 0.25, 0.4, 0.5, 1, 2, 3, and 5 watts although other values are available. The function of a regulator is to provide a constant output voltage to a load connected in parallel with it in spite of the ripples in the supply voltage or the variation in the load current and the zener diode will continue to regulate the voltage until the diodes current falls below the minimum IZ(min) value in the reverse breakdown region. It permits current to flow in the forward direction as normal, but will also allow it to flow in the reverse direction when the voltage is above a certain value - the breakdown voltage known as the Zener voltage. The Zener diode specially made to have a reverse voltage breakdown at a specific voltage. Its characteristics are otherwise very similar to common diodes. In breakdown the voltage across the Zener diode is close to constant over a wide range of currents thus making it useful as a shunt voltage regulator. The purpose of a voltage regulator is to maintain a constant voltage across a load regardless of variations in the applied input voltage and variations in the load current. A typical Zener diode shunt regulator is shown in Figure 3. The resistor is selected so that when the input voltage is at VIN(min) and the load current is at IL(max) that the current through the Zener diode is at least Iz(min). Then for all other combinations of input voltage and load current the Zener diode conducts the excess current thus maintaining a constant voltage across the load. The Zener conducts the least current when the load current is the highest and it conducts the most current when the load current is the lowest. If there is no load resistance, shunt regulators can be used to dissipate total power through the series resistance and the Zener diode. Shunt regulators have an inherent current limiting advantage under load fault conditions because the series resistor limits excess current. A zener diode of break down voltage Vz is reverse connected to an input voltage source Vi across a load resistance RL and a series resistor RS. The voltage across the zener will remain steady at its break down voltage VZ for all the values of zener current IZ as long as the current remains in the break down region. Hence a regulated DC output voltage V0 = VZ is obtained across RL, whenever the input voltage remains within a minimum and maximum voltage. In this type of regulation, series resistance and load resistance are fixed, only input voltage is changing. Output voltage remains the same as long as the input voltage is maintained above a minimum value. where V0 is the output voltage and VIN is the input voltage and ΔV0 is the change in output voltage for a particular change in input voltage ΔVIN. In this type of regulation, input voltage is fixed and the load resistance is varying. Output volt remains same, as long as the load resistance is maintained above a minimum value. When selecting the zener diode, be sure that its maximum power rating is not exceeded.